Borderlands 2's latest volley of DLC begins with another boost to the level cap and a challenging new dungeon. In the year since the initial launch of Borderlands 2, Gearbox has released four story expansions, two additional playable characters, an increase to the level cap, and a slew of minor DLC packs. Apparently that isn't enough, because the developer is about to gearing up to release a second "Ultimate Vault Hunter" pack to pave the way for even more end-game content. The Ultimate Vault Hunter Upgrade Pack 2: Digistruct Peak Challenge adds another 11 levels of potential (increasing the maximum level to 72 if you own the first upgrade pack), as well as unlocking a handful of new features for only the most powerful of Vault Hunters. Aside from the level cap increase, players who buy UVHUP2:DPC will be able to access a high-level mission, the Raid on Digistruct Peak. The new dungeon features a semi-random line-up of enemies, and is designed for a full party of four max-level players. If that isn't hard enough for you, you can also unlock eight "Overpower" levels to buff up enemies and drop loot far beyond your puny Level 72 gear. This new DLC isn't part of the Season Pass, so you'll have to shell out $4.99 to get the goods. Gearbox also announced plans for three "Headhunter" DLC packs to follow this one. Each of those packs will be built around a challenging new boss, whose head you can unlock for character customization once you defeat it. 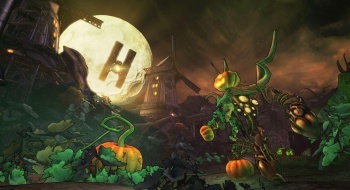 The first Headhunter DLC will be the Halloween-themed TK Baha's Bloody Harvest, due in October.